I was away from the garden for a long weekend in Prague, visiting friends who were teaching there for a month; a great city for a break with masses to see especially if you like Art Nuevo and music – ah the music! But I digress. Before I went away we had more than a week of strong winds with temperatures about average or a little below the norm for this time of year. On the day we left the direction of the wind must have changed bringing scorching temperatures of up 38 or 39° C, with wind as well on the first day. So in four days the garden looks totally different. Actually it looks as if someone went crazy it with a blow torch! I hadn’t begun the automatic irrigation because every morning there had been evidence of quite heavy dew, so I felt the plants should cope. I should have realised that the wind was already drying them out and that they needed a little help. The automatic irrigation is now on; I’ll post about the different types of irrigation tubes I use and what I think are the pros and cons of each kind soon. We are now entering the period when there are less blooms, only the toughest of plants flower when its this hot. So I am now relying on foliage and form to give life to the garden. Shiny, glinting silvers sparkle in the shimmering heat. Even very tough, drought tolerant plants like Cistus don’t look their best; their leaves shrivel a little to help prevent water loss. 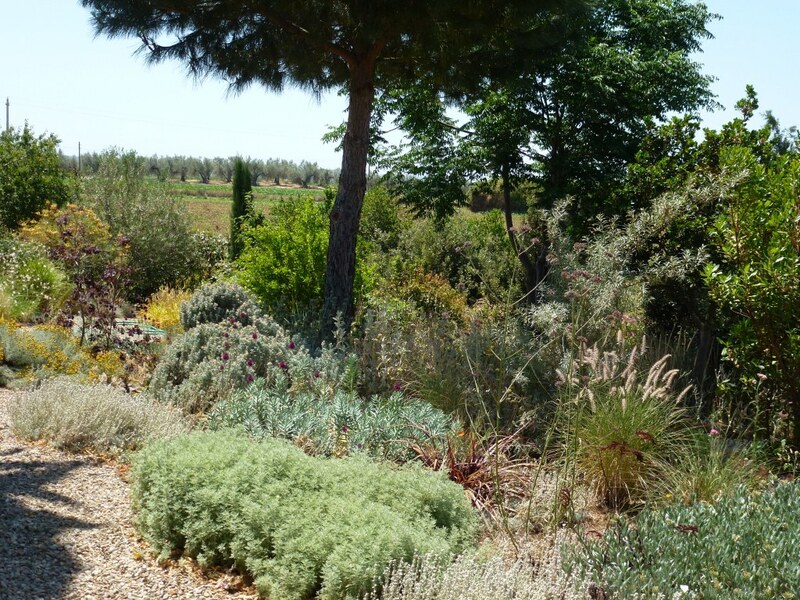 The garden has lost that feeling of lush plenty and is looking parched and lean. Not my favourite time. You can see in the above that my Cordyline is not happy, it really doesn’t like the heat; its days are numbered. 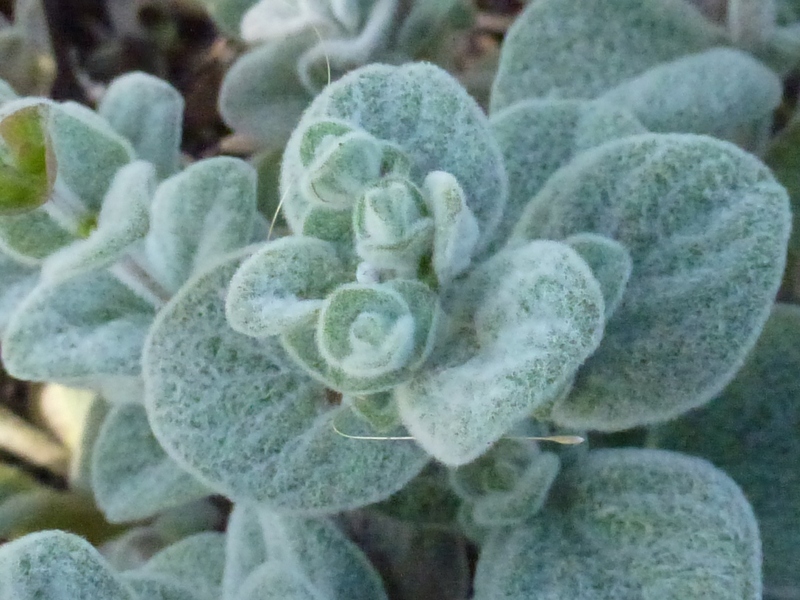 I showed this plant in spring, when it was wet so you could see how felt-like hairs on the leaf surface protect it from the strong rays of the sun. 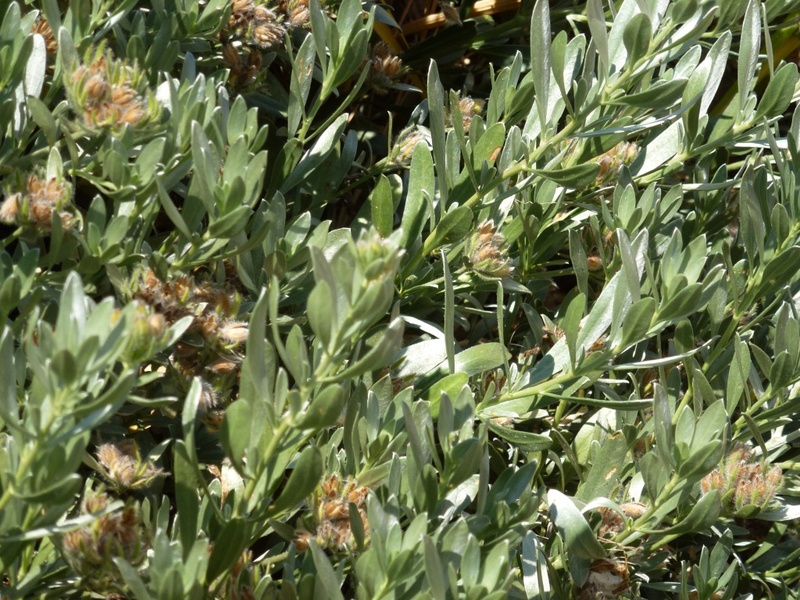 Without these silver-leaved plants the garden would be very sad in summer. 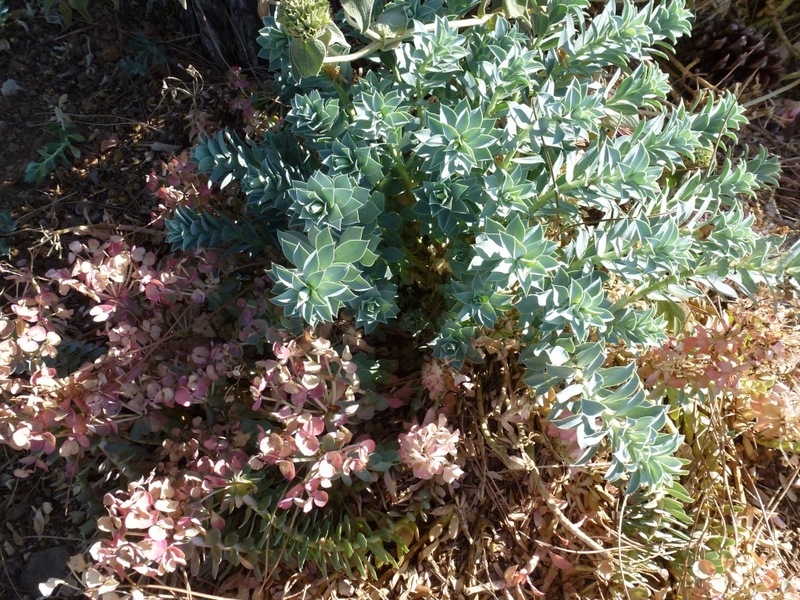 Euphorbia rigida’s new foliage is lifting itself clear of its spent flowering stems. The seed pods were popping for weeks, I expect to find many new seedlings in autumn, time now to clear away the debris. More work to be done, did I really say in an earlier post that there wasn’t much to do in June and July in the garden? The loveliest thing happening in the garden is all the bees and butterflies that fill the space with fluttering wings and various levels or buzzing. But even here there are things to shock. Looking at the lavender hedge of the formal beds and taking as many photos as I could I saw this, at first I could quite believe what I was seeing. Was the bee really being attacked? 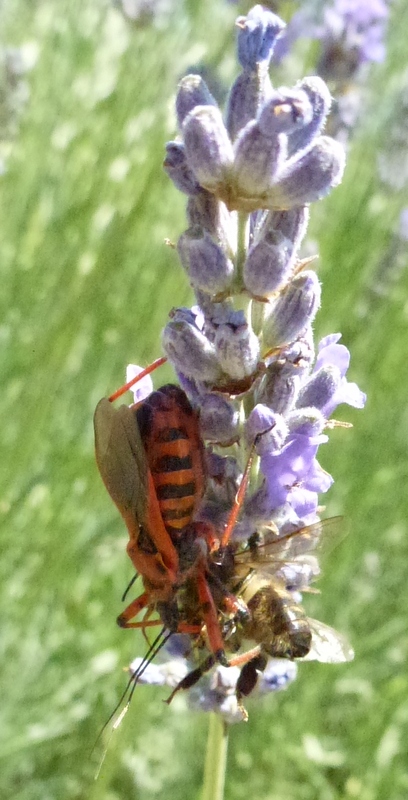 I really think it has trapped the bee and is eating it! What could it be? 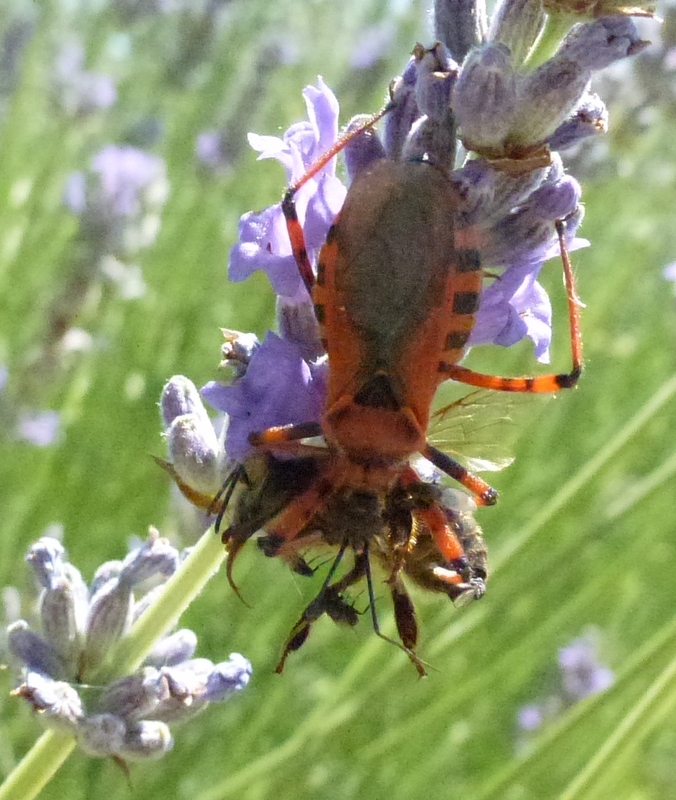 I checked in my ‘Complete Mediterranean Wildlife’ book and found that it is an Assassin Bug, Rhinocoris iracundus. I hope you will join in GBFD and tell us what foliage is looking great in your garden at the moment. To link in just leave a comment with a link to your post; I look forward to reading them. I’ll read and comment on all GBFD posts, thank you for joining in. This entry was posted in Bees and other insects, Foliage, Garden Blogggers Foliage Day, month by month, Weather and tagged Assassin Bug, automatic irrigation, convolvulus cneorum, drought tolerant plants, Euphorbia myrsinites, Euphorbia rigida, foliage, form, large island bed, Rhinocoris iracundus, silver leaved plants, texture. Bookmark the permalink. Сhristina, I love Cordyline and it’s pity that it seems such unhappy :((. Ugh…so sorry for the change in weather 😦 Here in Portland, we are on the cusp of our dry season…which always seems to change overnight! 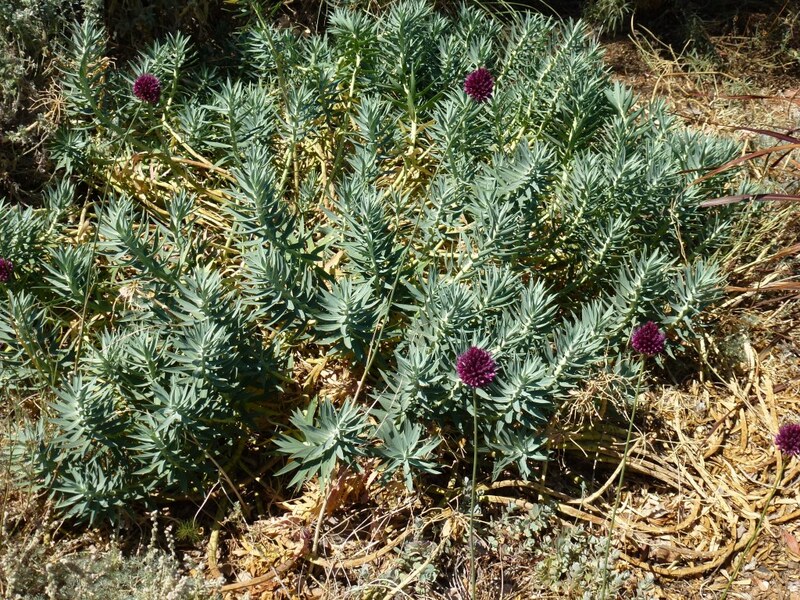 Love the Euphorbia myrsinites…I never have much luck with them…they do ok for a year or 2, then sprawl horribly. Here’s my contribution! Oops…that was just my blog link…here’s the actual post! the machine embroidery lace leaves are? I love blue and grey leaves. 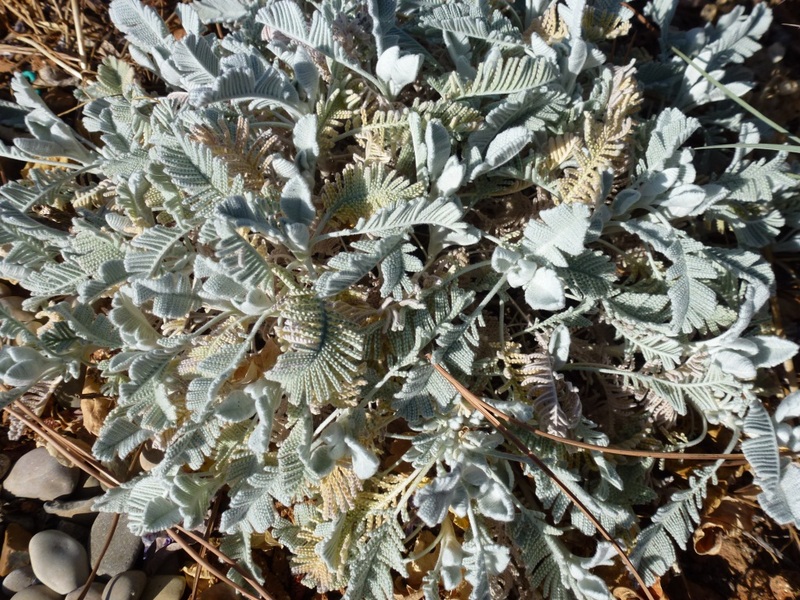 So sorry your garden was so dry when you returned from your break, just as well you have so many silver leaved plants. Feel so sorry for your poor bee, what a way to go! Our weather is the opposite of yours, non stop rain, everything has grown so huge! Christina, I like your euphorbia rigida. 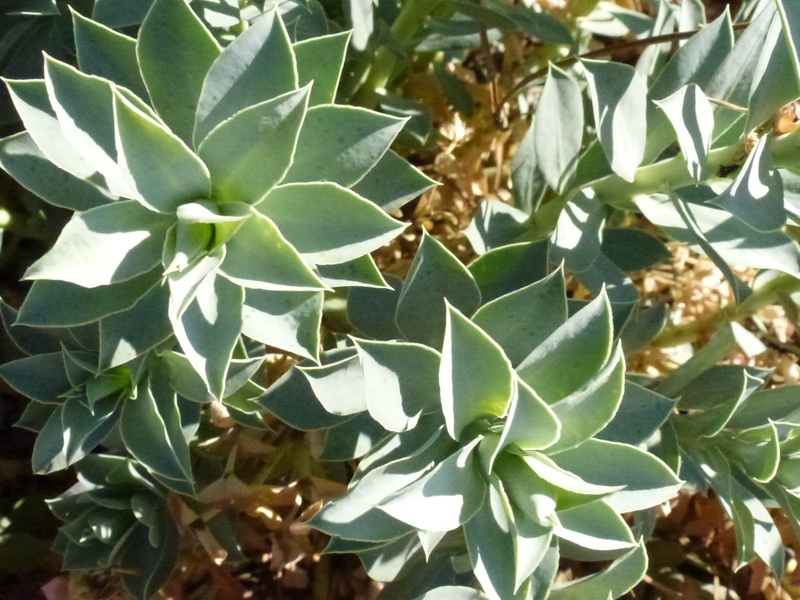 I am just recently beginning to appreciate the fine qualities of euphorbia. Lovely photographs I could feel the heat. 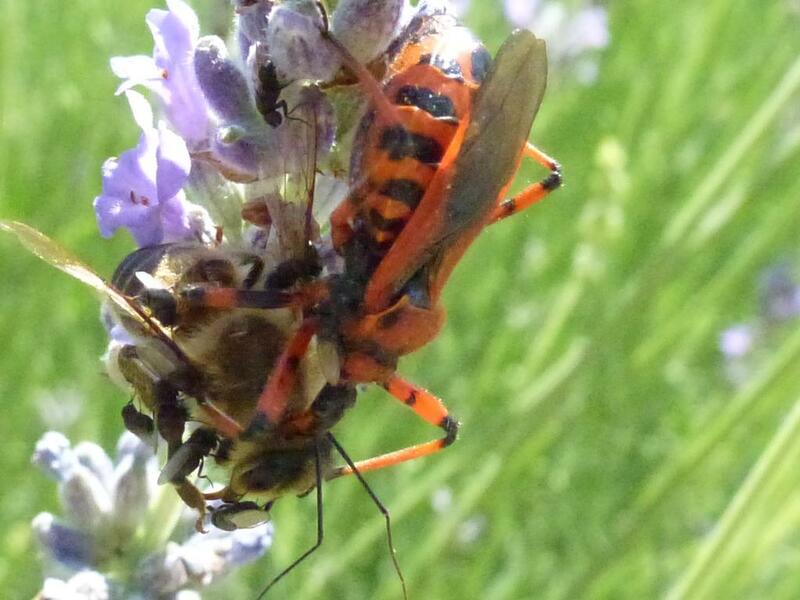 Very interesting Assassin bug. Christina I will add some foliage pictures of my flower profile on Monday to link in and then the next post will have a bit more…we are in our best bloom time so foliage takes a back seat. 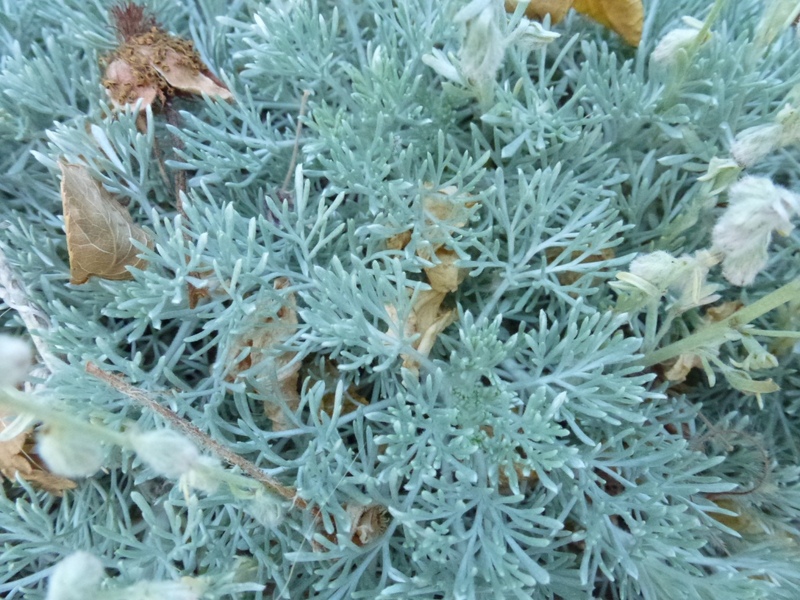 I love the blue green foliage of your garden…the SW US has this beautiful foliage too. I have a bit of it in the hottest spots. 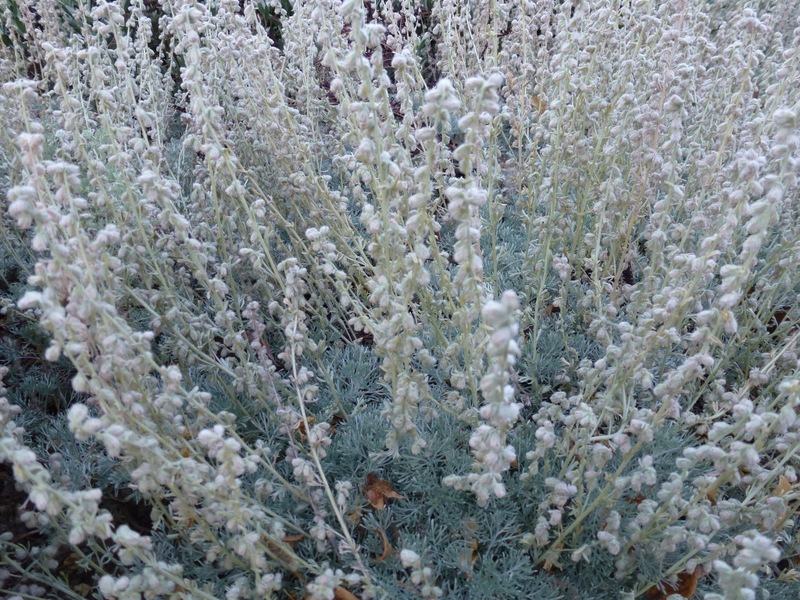 I enjoyed seeing all your silvery blue foliage. If I get to a real computer I will try to link my groundcover post (the one before the current one). I can’t imagine that sort of heat. 34-35 c is the most I’ve experienced although that was quite a while ago. I can see why this isn’t your favourite time in the garden. I think most people in the UK would like some of your heat. A friend’s barbecue last night had to be moved indoors as the rain poured down and so many events have been called off or turned into mud baths but then if it was so hot we’d only be complaining about the heat and everything needing watering!! 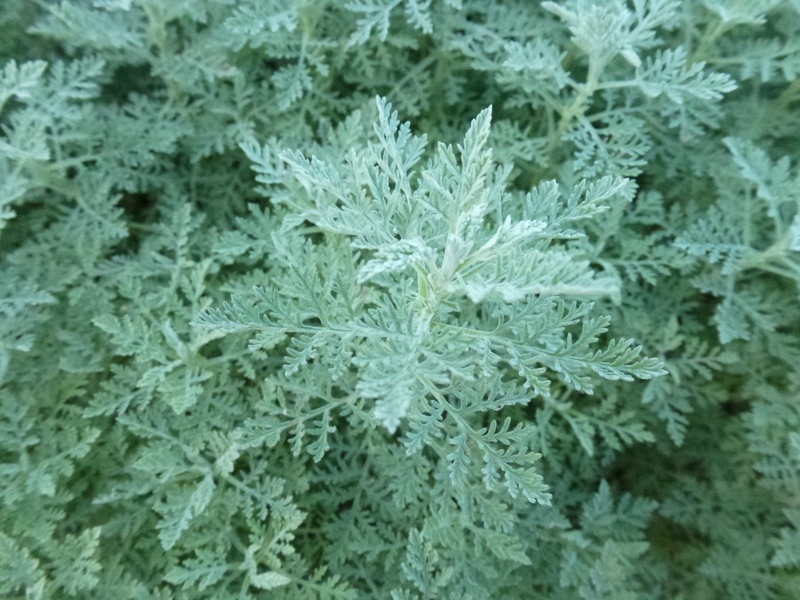 I love your Artemesia – great colour! It’s always disappointing when that hot, dry weather arrives. I used to just give up on flowers in late summer, and then I discovered salvias. Some of them seem to flower even more the hotter it gets. We were spoilt here last summer as it was cool and damp, but next summer is predicted to be hot. You’ve reminded me to enjoy the lushness of winter and spring while I can. It depends on the salvia. Some do need a lot of water, but others are really tough. 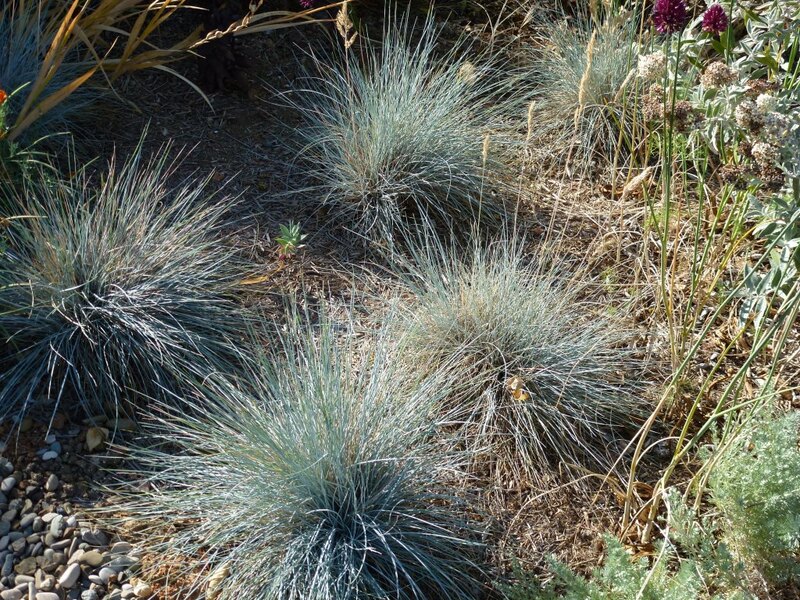 The ones that come from deserts are the most dry tolerant and they usually have small leaves that tend to be greyish. I find the low-growing Salvia chamaedryoides practically indestructible, and also varieties of Salvia microphylla. Both these flower for months, right up to the first frosts, no matter how dry it gets. Not sure if they’re cold tolerant enough for you, but they go down to -8 degrees C here with no problems. Love your silver galore!!!! My garden is kind of hibernating too…..looking forward to the cooler days of fall that is for sure! This week is suppose to be up above 105 all week – PHEW! Your garden looks beautiful hibernating or not Christina! It seems we share a ‘torched’ look to our gardens. I too am enjoying the silver/gray foliage this time of year. It really makes a difference in how cool the garden looks. A favorite these past few seasons has been globe mallow. I wonder if you’ve tried it?